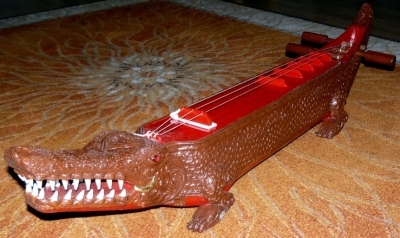 The crocodile zither "mi gyaun"
The "mi gyaun" zither is an ancient instrument of the Karen people of Burma. It was famous in the 18th and 19th century but is not performed anymore. 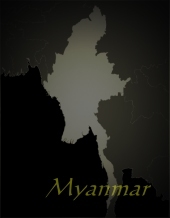 made of thread like the strings of the "saung" harp and are tuned in a fifth and an octave. The hollow body appears in a crocodile shape and is covered by a red painted cow bladder. The strings are played with a plectrum fast and rapidly.